You are currently browsing the tag archive for the ‘csr’ tag. Have you tried to implement programs for your employees that didn’t deliver the results you were hoping? I am mainly referring to team building or community involvement programs with a goal of engaging employees and boosting morale – but the lesson could apply to anything. I have found that companies with young employees are the most creative in getting employee buy-in for extra-curricular programs. It is probably because they are least invested in their career and aren’t afraid to say no, or just avoid opportunities, that more seasoned employees might feel they “should’ participate in. If the employer is determined to get high levels of participation and engagement, they need to figure out the formula that works with their staff. Getting staff to “invest” beforehand. For example, putting on a ski-day – pay $20 to sign up and if you attend you get your $20 back. The employer found that if it was free and easy to back out of, participation levels were very low despite up-front promises. Getting people to put ‘skin in the game’, however minor, increases their commitment. Lead by example – the management needs to walk the talk. If you are going to hold a fundraising drive or a company picnic – the management need to be there with enthusiasm. They need to donate themselves, roll up their sleeves to get dirty or volunteer to sit in the dunk tank. Giving a program lip-service and expecting those ‘below you’ to be enthusiastic about it, is generally unrealistic. Notice I didn’t talking about ‘making it fun’ or ‘putting a carrot on a stick’. Although those concepts are important in certain situations, the key to making a social program successful is ownership. The management and the employees need to feel and promote ownership of a program. And this ingredient is required as a first step in program development – not as a later inclusion when people notice the lack of involvement. 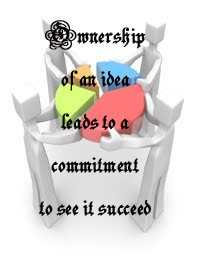 Ownership of an idea leads to a commitment to see it succeed. I am having trouble conveying my business services in an ‘elevator speech’. The easiest way to get people excited is to tell them a story. As I spend more time networking, I am telling my story more and more – so I figured I should write it down and perfect it. Most successful people, business owners included, donate money to causes that touch them. Whether it is because they have a personal connection or it was the person who last knocked on their door – they usually have a certain amount of income ear marked for community causes. Small business owners have a special opportunity. Let’s say you donate $2,000 per year to a number of random charities, some are close to your heart and some your acquaintances have convinced you to support. But you do it of your own accord out of your business income. What if, instead of doing your giving independently, you involved all your staff. You researched what causes are close to to your employee’s hearts and you matched their donation instead. What if you brought everyone together and picked a few causes to support as a business team. You would still donate $2,000 per year from your own pocket – but the amount going into the community increases dramatically. But the real benefit to your business would be that your team dynamics improve, employee loyalty and company pride increase and your impact on these charities is measurable. Now your $2,000 donation is working for your business as well as improving society. This where Social Fire can help. The principal consultant, September Kuromi, is someone with deep community connections, a talent for activating people and creative ideas for business success. Social Fire can help your business realize the return on your investment into the community. This is only a simple example story to introduce the concept of Social Fire services. There is so much potential when a business integrates community causes into its operations, opportunities like: becoming an innovative leader in your field because your business success improves the planet (like Toms Shoes); attracting top talent because they want to be part of your positive energy; or fulfilling your personal dreams of having an impact. Every business can create wealth and improve society.